Dermatoglyphics refers to the study of epidermal ridge patterns found on fingers, palms, and soles of hand and feet. Once formed, ridge patterns remain unchanged for life and no two individuals share the same patterns, which shows the genetic association of dermatoglyphics. Offspring of chronic periodontitis patients have a high prevalence rate of periodontal breakdown, suggesting a strong familial influence. Thus, the present study was carried out with an aim to evaluate the genetic association between dermatoglyphic patterns in periodontitis patients. If significant correlations exist, it will be possible to identify individuals at high risk for development of chronic periodontitis. A total of 60 individuals within the age group of 15–30 years were selected from the Outpatient Department of Periodontology, Institute of Dental Sciences, Bareilly, Uttar Pradesh. The sample size was estimated by G-Power software analysis. All the participants were divided into two groups of 30 each as the study group with chronic periodontitis patients (15 males and 15 females) and control group (15 males and 15 females). The study was conducted as per the guidelines of the Institutional Ethical Committee. A written informed consent was obtained from each individual after explaining them the procedure in detail in their vernacular language. A questionnaire which included patient's demographic data was recorded. The periodontal status of all the 60 participants was assessed clinically. Cooperative patients diagnosed as chronic periodontitis were included as the study group. The clinical attachment level, pocket depth, and Russell's periodontal index were calculated. Subjects with clinical attachment level greater than 5 mm and pocket depth greater than 3 mm involving more than 30% of the site were included in the study group. According to Russell, the periodontal index score was graded between 1.6 and 5. However, the control group showed measurement within the normal range. Patients with any trauma, scar formation, developmental disturbances involving hands such as Rete syndromes, and Anglesman syndrome were excluded from the study. The dermatoglyphic prints of all the ten fingers from both left and right hands were digitally collected using a computer connected to a biometric scanner (Futronics, FS80H, China) and digital flatbed scanner (Canon, Vietnam) for the palm prints. Care was taken to ensure that the full prints of the ridges were obtained. 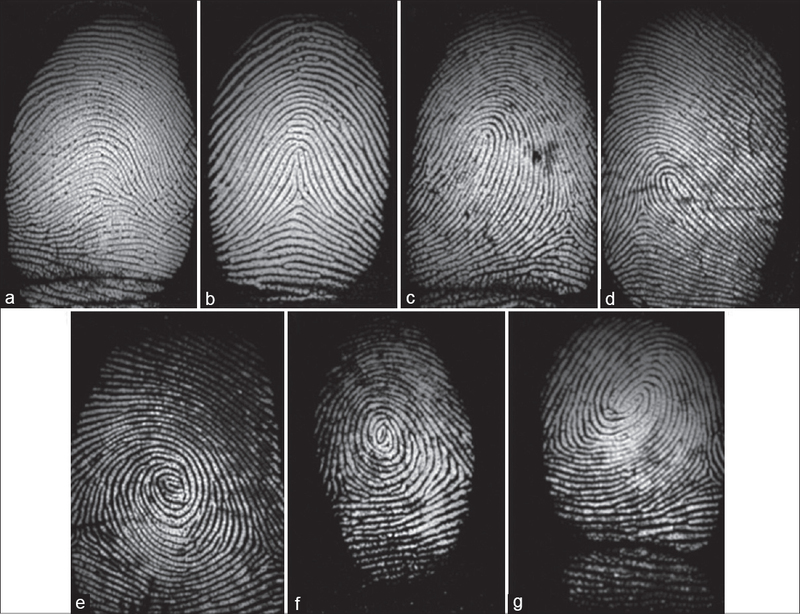 The observation of fingerprints and palm prints were manually accomplished for fingerprint pattern, finger ridge count, position of triradii, atd angle, a-d, and b-c distances, as mentioned below. Composite whorls – It is a complex pattern consisting of two deltas, with the epidermal ridges encircling a core. B. Total finger ridge count: It indicates the pattern size. A straight line is drawn connecting the delta to the point of core. The number of epidermal ridges between the delta and core was counted numerically. The ridges containing the point of core and delta were both excluded from the count. The observation of palm prints was manually accomplished as follows; Four digital triradii are normally situated at the bases of digits ii, iii, iv, and v; which are known as a, b, c, and d, respectively. Axial triradius is located near the most proximal margin of the palm in the space between thenar and hypothenar eminences. Depending upon the level of position, the axial triradius is termed as t. The atd angle is at the axial triradius t, between straight line drawn from t to a, and t to d. The line joining the points a to d as well as the points b to c forms the a–d and b–c distances  [Figure 2]. The person who conducted the fingerprint analysis was blinded to the details of data acquisition and periodontal status of the individual. To exclude the interobserver variability all the data was examined and evaluated by the same person. The data thus obtained was gathered using Excel sheet (Microsoft Office Professional Plus 2010). Statistical analysis of the data was prepared by using Chi-square and unpaired student t-test. P value of less than 0.05 was considered to be statistically significant. a–d and b–c palmer distances: The mean a–d distance in controls and chronic periodontitis patients was 59.13 ± 3.51 and 59.90 ± 4.76, respectively, which was not found to be significant. The mean b–c distance in control and periodontally compromised patients was 18.53 ± 1.85 and 18.93 ± 2.00, respectively, which was also not significant [Table 4]. The Pearson correlation coefficient among Russell's periodontal index to dermatoglyphic parameters in controls and chronic periodontitis patients showed a positive correlation except for total finger ridge count and a–d palmar distance in both the groups as well as in atd palmar angle and b–c palmar distance among control group, which showed a negative correlation [Table 5]. 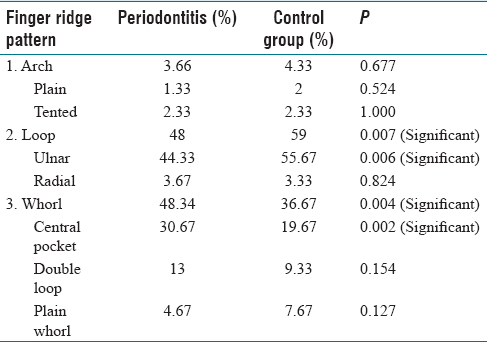 Comparison of Pearson correlation coefficient among controls and chronic periodontitis patients to various dermatoglyphic parameters showed a positive correlation among all the parameters except for adt palmar angle which was negative [Table 6]. Dermatoglyphics has proven its evidence in the field of anthropology, medicine, statistics, and genetics. It also helps in personal identification, crime detection, twin diagnosis, and racial variation. Recently, the most common metabolic diseases such as hypertension and diabetes mellitus have been studied using dermatoglyphics for early prediction. Countries such as United States and Japan have applied dermatoglyphics to diagnose Down's syndrome, congenital abnormalities, and genetic abnormalities. Dermatoglyphic patterns can be recorded rapidly with ease, with minimum equipment. It is an economical and noninvasive method without causing any trauma to the patient. Data collected can be preserved for long duration for future references. Studies on inheritance of dermatoglyphics by qualitative and quantitative methods have shown great resemblance among monozygotic twins and reasonably strong inheritance among siblings and parents. Because of the great diversity in the types and combinations of patterns found on the fingers, palms, and soles, it is evident that the formation of the dermal ridges would be determined by many genes spread over many chromosomes. Yilmaz et al. performed a study among 36 early onset periodontitis patients and 20 adult periodontitis patients and 20 periodontally healthy individuals. According to literature, offspring of chronic periodontitis patients have a high prevalence rate of periodontal breakdown, suggesting a strong familial influence. Chronic periodontitis have multifactorial etiology such as smoking, poor oral hygiene, stress and immunosuppression, strong familial influence, and gene polymorphism. Because of the significant diversity in patterns found in different diseases, offspring of chronic periodontitis patients are suggestive of specific dermatoglyphic patterns. In the present study, there was significant increase in the whorl pattern in chronic periodontitis patients. Among the whorl pattern, central pocket whorl pattern was significantly increased. The second most common pattern found in the chronic periodontitis patients was the loop pattern. Among the loop pattern, ulnar loop pattern was found to be increased. Yilmaz et al. in 1993 performed a study among chronic periodontitis patients and periodontally healthy individuals. The results were similar to the study of Atasu et al. and Babitha et al., which also showed increased frequencies of concentric whorls and transversal ulnar loops in chronic periodontitis patients., The results were dissimilar to the study of Kochhar et al. who found decreased frequency of loop pattern in periodontally compromised patients. Unlike the present study, the authors found no significant relation of whorl pattern. Further research should be recommended in future for more accurate prediction by raising the number of study samples from different geographical areas with different ethnic origin. Dermatoglyphics may serve as an early predictor in identifying the high risk group individuals of developing diseases like chronic peridontitis that have a strong hereditary background. This study would be helpful in formulating counseling messages based on dermatoglyphic pattern prevalent among young generation and their possible stimulation to determine the young people's likelihood to develop chronic periodontitis in their later age. Prabhu N, Issrani R, Mathur S, Mishra G, Sinha S. Dermatoglyphics in health and diseases- A review. J Res Adv Dent 2014;3:20-6. Deotale S, Dubey S, Gattani D. Role of dermatoglyphics as a potential diagnostic marker for periodontitis: A clinical study. IOSR J Dent Med Sci 2016;15:99-103. Petit MD, Steenbergen VTJ, Timmerman MF, De Graaff J, Van der Velden U. Prevalence of periodontitis and suspected periodontal pathogens in families of adult periodontitis patients. J Clin Periodontol 1994;21:76-85. Russell AL. A system of classification and scoring for prevalence surveys of periodontal disease. J Adv Dent Res 1956;35:350-9. Henry ER. Classification and Uses of Fingerprints. George Routledge & Sons: London; 1900. Oladipo GS, Osogba I, Bobmanuel I, Ugboma HAA, Sapira MK, Ekeke ON. 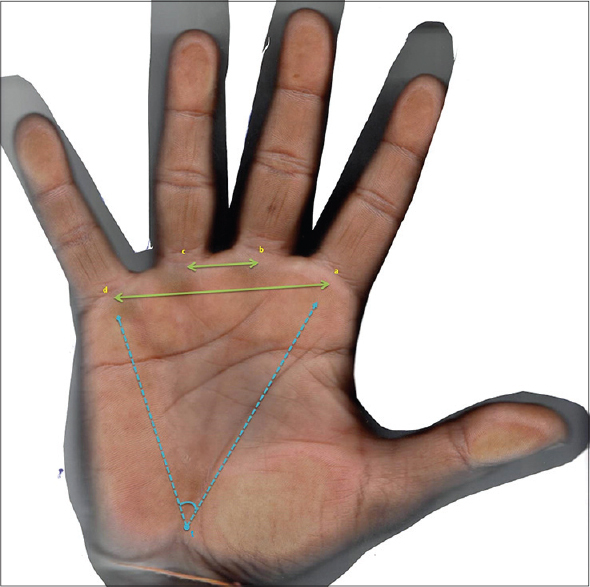 Palmar dermatoglyphics in essential hypertension amongst Rivers Indigenes. Aust J Basic Appl Sci 2010;4:6300-5. Tafazoli M, Dezfooli R, Kazemi T, Shahri HM, Shahri NM. Comparison of dermatoglyphic patterns between healthy and hypertensive people. Asian J Med Sci 2013;5:19-25. Denny EC, Ahmed J, Shenoy N, Binnal A. Dermatoglyphics in dentistry – A review. Int J Curr Res Rev 2013;5:30-3. Devishree G, Gujjari SK. Dermatoglyphic patterns and aggressive periodontal diseases – A possible link. J Dent Med Sci 2015;14:69-70. Atasu M, Kuru B, Firatli E, Meric H. Dermatoglyphic findings in periodontal diseases. Int J Anthropol 2005;20:63-75. Babitha GA, Yadav SC, Prakash S, Suresh K, Deotale S, Gaikwad S. Dermatoglyphics, ABO blood groups with Rh factor- An exploring link to periodontitis. Int J Curr Res 2016;8:34224-8. Kochhar GK, Shahi P, Advani S, Singh P, Kaushal S, Nangia T. Dermatoglyphics of dental caries and periodontal diseases in children of North India. J Pharm Biomed Sci 2014;4:658-63.